Difference between revisions of "Lobzang Dongak Chökyi Gyatso"
'''Lobzang Dongak Chökyi Gyatso''' ([[Wyl.]] ''blo bzang mdo sngags chos kyi rgya mtsho'') (1903-1957) aka '''Tulku Sungrap''' — a disciple of [[Tertön Sogyal]] and [[Amdo Geshe Jampal Rolwé Lodrö]]. It was was Amdo Geshe who recognized him as the incarnation of Alak Dongak Gyatso, and enthroned him at Nyenmo Gön. He wrote several works comparing the view of [[Dzogchen]] with that of [[Mahamudra]] and [[Anuttarayoga Tantra]], and a commentary on the ''[[Ornament of the Middle Way]]''. His writings, such as ''The Jewelled Mirror of Pure Perception: Establishing the Single View of the Old and New Traditions of Secret Mantra'' (Wyl. ''gsang sgangs gsar rnying gi lta ba gcig tu sgrub pa dag snang nor bu’i me long'') are remarkable for their attempt to synthesize the views of the [[Nyingma]] and the [[Sarma]] [[tantra]]s, and to explain the terminology of each in the light of the other. 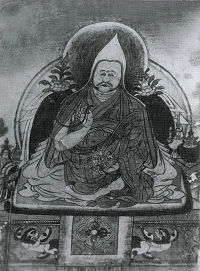 '''Lobzang Dongak Chökyi Gyatso''' (Tib. བློ་བཟང་མདོ་སྔགས་ཆོས་ཀྱི་རྒྱ་མཚོ་, [[Wyl.]] ''blo bzang mdo sngags chos kyi rgya mtsho'') (1903-1957) aka '''Tulku Sungrap''' — a disciple of [[Tertön Sogyal]] and [[Amdo Geshe Jampal Rolwé Lodrö]]. It was was Amdo Geshe who recognized him as the incarnation of Alak Dongak Gyatso, and enthroned him at Nyenmo Gön. He wrote several works comparing the view of [[Dzogchen]] with that of [[Mahamudra]] and [[Anuttarayoga Tantra]], and a commentary on the ''[[Ornament of the Middle Way]]''. His writings, such as ''The Jewelled Mirror of Pure Perception: Establishing the Single View of the Old and New Traditions of Secret Mantra'' (Wyl. ''gsang sgangs gsar rnying gi lta ba gcig tu sgrub pa dag snang nor bu’i me long'') are remarkable for their attempt to synthesize the views of the [[Nyingma]] and the [[Sarma]] [[tantra]]s, and to explain the terminology of each in the light of the other. Lobzang Dongak Chökyi Gyatso (Tib. བློ་བཟང་མདོ་སྔགས་ཆོས་ཀྱི་རྒྱ་མཚོ་, Wyl. blo bzang mdo sngags chos kyi rgya mtsho) (1903-1957) aka Tulku Sungrap — a disciple of Tertön Sogyal and Amdo Geshe Jampal Rolwé Lodrö. It was was Amdo Geshe who recognized him as the incarnation of Alak Dongak Gyatso, and enthroned him at Nyenmo Gön. He wrote several works comparing the view of Dzogchen with that of Mahamudra and Anuttarayoga Tantra, and a commentary on the Ornament of the Middle Way. His writings, such as The Jewelled Mirror of Pure Perception: Establishing the Single View of the Old and New Traditions of Secret Mantra (Wyl. gsang sgangs gsar rnying gi lta ba gcig tu sgrub pa dag snang nor bu’i me long) are remarkable for their attempt to synthesize the views of the Nyingma and the Sarma tantras, and to explain the terminology of each in the light of the other.